As you may know, since having little Theo a month ago, I've become much more interested in anything that makes the world a better place, and that includes investigating the options around more eco-conscious, ethically made or environmentally-sound products. More of us than ever are beginning to ask questions of the brands we know and love, asking them to be transparent and to do business in a conscientious manner, from food products to washing power. This can be slightly more difficult when it comes to fashion. Brands that are ethical sometimes sacrifice style for their principles, and many of us struggle to balance our desire to support the good guys with the need to look good! Its one of the hardest battlegrounds. 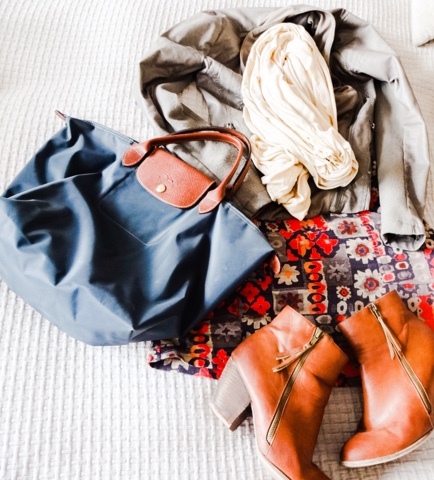 That's why I was especially pleased to discover on-trend ethical clothing brand, Nomads. If you have an adventurous spirit, strong principles and a love of well made, stylish clothing, you'll probably want to discover them too. With the 1970's trend storming the AW15 runways thanks to couture brands like Gucci, MaxMara and Miu Miu, this patterned cord 'Rana' miniskirt struck me as the ultimate autumn piece. Its made from a soft cord material, with an A-line cut, and a pretty pattern in muted shades of burnt orange and deep blue, with cute little pockets at the side. Pockets are too often overlooked when it comes to women's clothing! 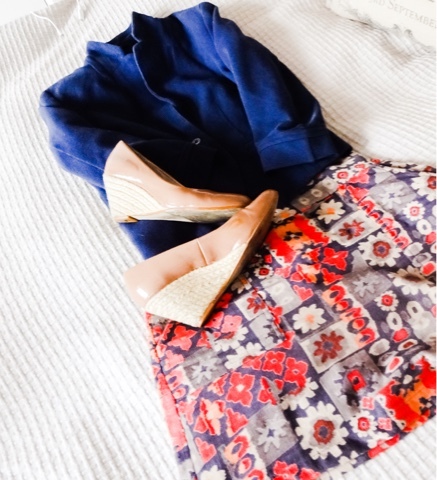 I tried styling it up in four different ways, to show how versatile a piece it is: as a casual daywear outfit, for an evening out, for work, and for a relaxed weekend. Pairing the skirt with tan ankle boots, a grey waterfall leather jacket, a cosy cream infinity scarf, and a petrol blue canvas bag, it would be brilliant for meeting with friends, going shopping or popping out for coffee. I love how the colour works with this Longchamp Le Pliage tote bag. 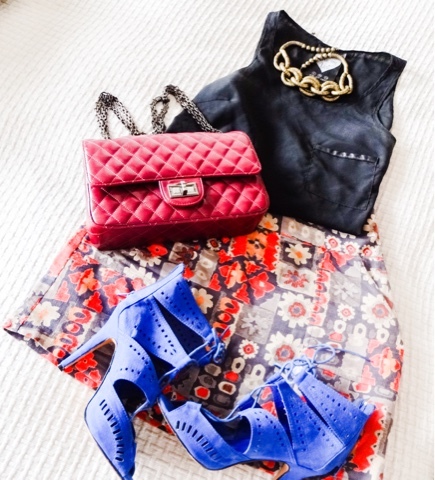 To take the skirt into the evening, I added a black silk shell top, a pair of statement blue suede heels, a cute burgundy quilted chain strap bag, and a bold chunky necklace. This combination would work so well for dinner with the girls or even a date night with my husband. To make the skirt work for country rambles at the weekend, I'd match with a Breton stripe sweater, navy padded gilet and a pair of chestnut knee-length boots. I can just see this combination working a treat for autumn strolls ending in a country pub lunch (my new favourite thing to do now Theo's here). 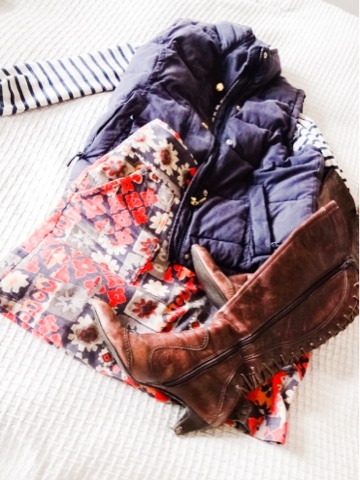 The skirt is a really great match with this Joules gilet. This skirt could even work for the office when matched with a textured navy blazer and a pair of brown patent wedge heels. Perfect for bringing a bit of style and colour to your working wardrobe. So, we know the fashion works, what of the company behind it? Founded in 1989, Nomads produce elegant, feminine clothes with a global flavour. They've always been fair trade, working closely with local producers to create a sustainable product and a good standard of living. If you believe in 'trade not aid', as I do, this will chime well with your values. Nomads incorporate traditional handwork like tie-dying and hand embroidery to keep these crafts alive and allow them to generate an income for villagers. They also seek to reduce the environmental impact of their range by using materials such as organic cotton. It's really great that all of this doesn't have to mean sacrificing style though. With quality products, great design and amazing values, this brand is definitely one to know. Nomads are very kindly offering a special 20% discount to my readers as well, so snap some new ethical autumn clothing up using the code BLOG20. View the rest of their clothing collection here. Find Nomads Clothing on Twitter here. I've been through such a change in this area recently too! If you care about making a difference the biggest things you can do are probably around your home - eliminating the use of paper towels is a biggie, as is switching over to natural cleaning products and using all reusable bags. I did that after I realised that fairy goes down the drain, into the sea and blummin kills marine life! I don't want that on my conscience!